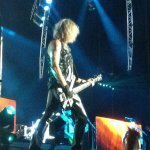 Def Leppard and KISS continued the Summer Tour 2014 last night in San Diego, CA with another unchanged 14 song set played. The band played another 75 minute set at the Sleep Train Amphitheatre. The show started with the live snippet of 'Won't Get Fooled Again'. The next show takes place on 8th July in Los Angeles, CA.